Shoot First-Ask Questions Later, are also the Pro-Con people. They'll make their decision, but then feel a twinge of buyer's remorse and then verbally justify their doubts away. "Oh, I'll just stick with the keychain card, I always have my keys with me anyways." "I'll stick with the wallet, the keychain one probably falls off easier." To which I assuage their fears, "The keychain one is always convenient," or "The keychain ones do fall off quite easily." Lastly, there's the Flip-Flopper, they tend to take longer to make their decision. You can actually see the gears turning in their head as they squint at the cards as if they are trying to read a fortune ball which will give them the answer to the biggest dilemma they have encountered. Once they have decided on one, they state their decision with such excitement, only to doubt their decision by the end of me entering their information into the database that they ask if it's too late if they can get the other kind of card. I smile and tell them it's not, and ask them if that's their final answer (sorry for the second game show reference in one post). So the real question is: do you want to see how deep the rabbit-hole goes at the Circulation desk? Permalink Submitted by StephenK on January 4, 2010 - 10:37pm. 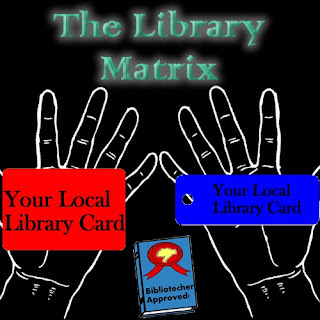 My local library does not ask whether you want keyring or wallet-sized cards. You get both.